These patients had undergone aggressive upper and lower lid lifts (blepharoplasties) in the past, which had left them with a 'round eye' appearance. Dr. Yaremchuk produced a noticeable improvement by performing corrective midface lifts and lateral canthopexies. 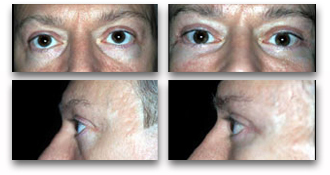 Two lower lid lifts (blepharoplasties) had left the whites of this man's eyes overly visible (excessive scleral show). Dr. Yaremchuk corrected the shape of his eyes via a midface lift and by tightening tendons near his eyes (a lateral canthopexy). Click here to see the dramatic change in eye shape effected by the surgery. This patient was displeased with a 'round eye' appearance and symptoms of dryness after lower eyelid surgery. The dropping of his lower lid was due to excessive removal of eyelid tissue during his surgery, and to a deficiency of bone support behind his lower lid. Dr. Yaremchuk restored his eye shape and improved his facial contour by elevating his lower lid and tightening it with a midface lift and lateral canthopexy, respectively. Dr.Yaremchuk provided support to the lower lid and improved the patient's cheek contour by placing an infraorbital rim implant on the bone behind the lower eyelid. This patient had a previous blepharoplasty. She was displeased with the amount of white showing between her iris and lower lid as well as the downward tilt of the corner of her eyes. She was predisposed to having this problem because of the lack of bone support beneath her eye. Dr. Yaremchuk improved here eye shape and upper facial contour with surgery similar to the patient shown above: midface lift, augmentation of the infraorbital rim with a porous implant and lateral canthopexy.